We don’t even know where to start. There’s a new live video of a new song, a new song posted to Jacob’s Soundcloud, and two new shows announced! Saturday’s show at the Brewhouse Music & Grill in Rome, Georgia, was amazing. A bunch of Squad members were there right in the front row for Jacob’s show opening for Old Dominion. During the show, Jacob and the Noise (the band’s name for the show) performed one of their new songs, Thinkin Bout You, and we’ve uploaded the video to our YouTube page – check it out below!! He then announced two new shows for January, opening for Chase Bryant. Jan. 8 at the Blind Horse Saloon in Greenville, SC and Jan. 9 at Coyote Joe’s in Charlotte, NC. Make your travel plans now! Jacob and the guys have three shows this week and we can’t wait to hear all about them. Dec. 3 at The Varsity in Baton Rouge, La., Dec. 4 at The Brass Monkey in Shreveport, La., and Dec. 5 at Banita Creek Hall in Nacogdoches, Texas. Country entertainment website Whiskey Riff is loving Something To Remember You By so much that they’ve made it their Song of the Week!! Click below for their post, and the video! If you’re like us, we love reading lyrics. Well, here they are for Jacob’s song Flight Risk. Calling all Squad members (that’s you!) – help us get the word out about Jacob and his music! The power of word-of-mouth is amazing, so please share anything about Jacob you can – this page, his social media, the videos on YouTube, the songs on his website. Any of it will help him – and that’s what we’re all about! Thank you! * All Squad and Jacob social media links can be found on this page on the upper right side! Thank you SO MUCH for all of your interest in Jacob and your help spreading the word about his talent! So Jacob totally blew us out of the water today. First, he and Teddy dropped an awesome double-acoustic Periscope, including a new song and new concert information. If you don’t follow Jacob or Teddy on Periscope, make sure that you find them soon: @JacobDavisMusic and @ChristenberryT. So thank you, Jacob. You win Friday! UPDATE NOV. 2016: We’re no longer able to send CDs – but look for Jacob’s music available for purchase! 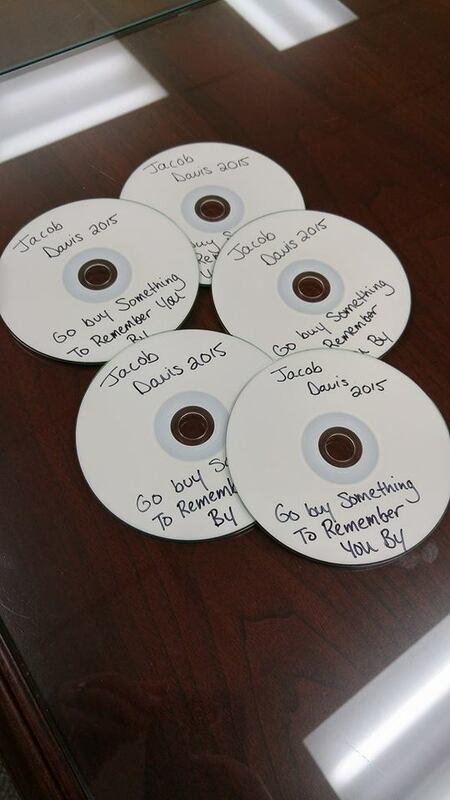 We’re on a mission to get Jacob’s music into everyone’s hands – so we’re sending out CDs of his music! Visit our Facebook page: https://www.facebook.com/JacobDavisSquad/ and message us with your name and address and we’ll send you one for free! All you have to do is follow us and Jacob on social media (links are found in the right column on this page). If you live outside of the U.S. or Canada, please email us at JacobDavisSquad@gmail.com and we can email the files to you! Be sure to buy Something To Remember You By also! Have you ever known that there was a big secret and you couldn’t wait to hear more about it? And then when you were finally let in on the secret, you couldn’t wait to shout it from the rooftop? Well, consider this the rooftop. If you haven’t seen a Jacob Davis show live, you’re completely missing out. We’ve collected photos from fans at the Dusty Armadillo show and put them into a Facebook photo album, so please click HERE to visit the public album!! BIG shout-out to country music website and social media platform Whiskey Riff for featuring Jacob’s Something To Remember You By video on their site!! Click here to see the post, along with the video! On Monday, Nov. 2, Jacob released the acoustic video for his current single Something To Remember You By – check it out!! Fan club of Jacob Davis Music! What I Wanna Be – Go Get It! If you have photos, videos, or even questions, please email us at JacobDavisSquad@gmail.com - we would love to share! If you have photos, videos, or even questions, please email us at JacobDavisSquad@gmail.com - we would love to share! For anything related to Jacob professionally, please contact his label, Black River Entertainment.